1. Information sessions: Countrywide information sessions to encourage and coordinate public participation. The process of amending The Constitution and the implications of expropriation without compensation will be discussed with various organisations, chambers of commerce and agricultural associations. Civil society and individuals must make as many submissions as possible during the process of public participation to oppose the proposed amendment to The Constitution. 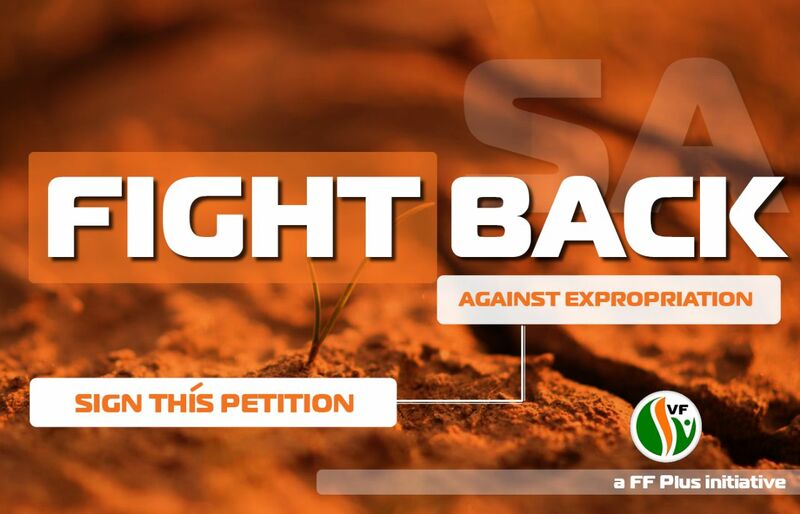 South Africans must be aware that the proposed amendment will strip everyone in the country of their right of ownership – it will not just affect the rights of agricultural landowners – and that it will destroy South Africa’s economy. 2. Meeting with the State President: request an urgent meeting with President Cyril Ramaphosa and will later hand over a list of grievances together with a petition. 3. Petition: Submit a petition during the process of public participation. The petition is distributed countrywide and is also available online at: fightbacksa.org.za. 4. Protest action: Plan a mass protest for South Africans to stand up for the protection of their right of ownership. 5. Internationalisation: Active liaising with the European Parliament, governments, the United Nations (UN), the African Union (AU), SADC-tribunal and by way of the FF Plus’s membership to UNPO. The leader of the FF Plus will leave for Europe on the 21st of March to have various meetings in this regard. South Africa is a signatory of the UN’s Declaration of Human Rights. Expropriation without compensation is a violation of section 17 of this Declaration. 6. Expropriation fund: A trust fund is set up and the FF Plus will actively raise funds to strategically fund legal actions related to the process of amending the Constitution and to assist landowners should landgrabs take place. Not only expropriation of land, but expropriation of any property in South Africa, as was accepted in a motion in the National Assembly, is a grave threat to the democratic principles of the right to ownership. I, the undersigned, do not support the proposed amendment to Article 25 of The Constitution, which will enable the state to expropriate any property without expropriation.